Native English badgers to be culled. Oh no, I love them! I am sad about the proposed badger cull. As we were driving home late last weekend from a delicious African dinner in Stanton-St. John (chicken in peanut sauce with basil) we saw a badger run across the road in front of our car. I love these unexpected encounters. Wild-life continues to startle us with its wonder, surprise, and sheer loveliness. It is to me a reminder of the grace, wildness and wonder of God!! 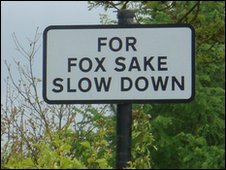 I like this rural Oxfordshire sign. For badgers’ sake too, and rabbits, and deer.